News : Bacillus Calmette Guérin in the treatment of patients with non-muscle invasive bladder cancer: what dose and duration of treatment? 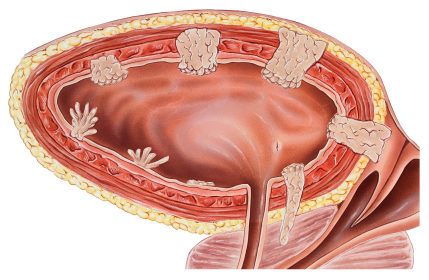 Bladder Cancer is the most common malignancy of the urinary tract, the seventh most common cancer in men and the seventeenth most common cancer in women. Approximately 75% of patients present with what is called “non-muscle-invasive bladder cancer” which has a high prevalence due to long-term survival rates of 60% or more at ten years. However approximately 40% of patients will recur within five years and 10% will progress to muscle-invasive bladder cancer with a correspondingly higher risk of cancer specific mortality. Lifelong follow up is required in order to monitor patients for recurrence. For this reason, bladder cancer is the most expensive of all cancers to follow and treat on a per patient basis. After surgical removal of the bladder tumor (TUR), either chemotherapy or bacillus Calmette-Guèrin (BCG) immunotherapy is put into the bladder to try to prevent disease recurrence. Although BCG is more effective than chemotherapy in preventing disease recurrence and progression, it is also more toxic. For this reason, patients at low risk risk of recurrence and progression receive chemotherapy, high risk patients receive BCG, and intermediate risk patients receive either chemotherapy or BCG. Various strategies have been employed to try to reduce the toxicity of BCG including decreasing the dose and the duration of treatment. However until now, the optimal dose and duration of BCG treatment remain unknown. EORTC study 30962 was launched in 1996 in intermediate and high risk non-muscle invasive bladder cancer patients to determine if one third dose is as effective as full dose BCG, if one year of treatment is as effective as three years of treatment and if one third dose and one year of treatment are associated with less toxicity. After the accrual of 1355 patients and a median follow up of seven years, it was found that one third dose BCG was not less toxic than full dose and that three years of maintenance was not appreciably more toxic than one year of maintenance. Patients randomized to receive one third dose during one year had the highest recurrence rate at five years, 45.5%, and patients randomized to receive full dose during three years the lowest, 35.8%. In patients receiving full dose BCG, three years of treatment was more effective than one year of treatment in preventing recurrences in high risk patients but not in intermediate risk patients There were however no differences in progression or survival. The results of this study provide an important contribution to day to day clinical practice in the treatment of patients with intermediate and high risk non-muscle invasive bladder cancer who receive BCG. It has now been shown that there is no reduction in toxicity by treating patients with one third dose, and that one third dose during one year is less effective in preventing recurrences as compared to the other treatment groups. Based on the results of this study, it is recommended to treat intermediate risk patients with full dose during one year, thus saving these patients from the costs and inconveniences of an additional two years of treatment. However in the high risk patients who received full dose BCG, three years of treatment reduced recurrences as compared to one year of treatment although there were no long-term differences in progression or survival. Thus in high risk patients, the benefit of the two additional years of treatment on recurrence should be weighed against its inconveniences and side effects.